Amid the swirl of people coursing through Hong Kong's streets, city dwellers often come in close proximity, in restricted spaces. While people usually hurry past without heeding others, there rest invisible connections between these strangers in the ever-fascinating urban landscape. These intangible relationships furnish the underlying theme of Cross, a group exhibition presented by YY9 Gallery. The show features the works of four local artists, who explore the emotional distances between Hong Kong residents in their everyday lives through photography, video and ceramics. In the words of curator Movana Chen, Cross is a reflection on the intersection of people, the urban landscape, and individual edifices and objects. The four featured artists express their perspectives in new and earlier works, which come together to stir up a creative dialogue in the minds of spectators. "The photos of empty crossroads by Galen Tse challenge our typical images of busy streets. They also contrast the images of pedestrians coming in close contact by Evangelo Costadimas. The works featured in Cross aim to be a playful take on the muted, tacit communication that takes place in our city." In his series 'Passers-by', Galen Tse gives personification to Hong Kong landscapes, inanimate objects and people. Down Memory Lane Tse rediscovers images of heavy rain on the streets of Mong Kok, his favorite parks from childhood, and passers-by in old districts like Sham Shui Po. "The images are computerized to recreate different layers of memory and emotion," Tse noted, "In images of the new there's a touch of older times, of different manifestations of my memories of the city as an observer. As a longtime photographer there're many such anecdotes I'd like to re-capture in my works." Tse remarked that the sentiments in the images are a direct expression of his creativity and state of mind while capturing them. Tse believed his take on city life echoes the experience of many fellow Hongkongers, since his images are slides of scenery and history around town. "My exploration has no end; I'm always looking for new subjects and inspirations around the city, to represent the wider perspective of Hong Kong people. With continual passers-by in our public space, there are different concepts and styles to experiment each time I go on the streets." Evangelo Costadimas shares the same aspirations in his latest series of street photographs entitled 'Shooting Blind'. In a departure from preconceived notions of composition, the photographer shoots from the hip, capturing images of pedestrians on a daily basis, so as to find fresh points of view on his subjects. "Hong Kong is heaven for street photographers," he declared. "Street photography is all about the 'decisive moment', perhaps an ironic juxtaposition or a humorous situation. When I'm out photographing, I have no control of who will be there at that time and place. It's a matter of instinct." For Costadimas, the street photographer works to create a relationship between the subjects pictured and spectators, while rendering himself invisible. The viewer should be transported to the time and place in the photo, in a smooth and implicit intersection posed by the photographer. "In my works I'd like to think I'm holding up a mirror to Hong Kong society, showing Hong Kong people what they're like. I'll continue this Shooting Blind series until the end of the year. After that I may switch to a studio project over which I have total control, or I may think of another way to push the limits of my street photography." The interaction takes on a more intricate and manipulative form in the video clips by Silas Fong. The digital video Upon the Escalator shows passengers traveling on three escalators at an MTR station at different times of day. The rapid glances of passengers are edited in a way that causes them to intersect with the glances of others. The project is a development of the artist's previous works, which feature footages of people coming in and out of lifts and pedestrians on the road outside of bus windows. Fong has always been interested in the flow of people on public transport, since it is a kind of journey the passengers must complete. "On the escalators, for example, you must get to the end until you can leave the space. It gives me an opportunity to watch them observing the surroundings. During the editing of this video, I discovered how people could interact with one another even if they inhabit the space at different moments." Apart from digital videos, Fong explores the conflicts between public space and private lives in a Web log. The blog is a collection of stories of strangers who reveal private details or their personal life in Facebook or other online channels, while Fong keeps track of their happenings. Former animation artist Karen Cheung captures Hong Kong residents' life in her ceramic penguins. The series was inspired by the everyday labor of the city's familiar characters, such as construction workers and furniture movers in Sham Shui Po and Sheung Wan, the districts where Cheung lives and works. 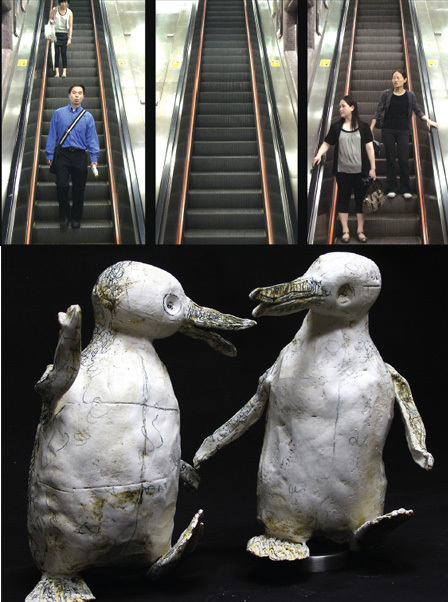 Cheung chose penguins as the subjects of her creation, since they are frequently personified in popular media and highly accessible to most viewers. Her penguins bear human characteristics which viewers can immediately relate to, such as tank tops and shorts on a construction worker. "I hope to trigger a feeling of warmth in the viewers with these familiar sights of their life," Cheung contended. "In these old neighborhoods, there's often recognition or even understanding between people who are strangers, but play a small part in one another's daily life." Cheung's creations also aim to highlight the thriving of Hongkongers throughout economic downtimes. "I'm touched by the spirit these workers represent as they're out working on the streets. Through my works I try to translate this spirit into art, and share it with my audience." Cross is open until 31 July at YY9 Gallery. Details are available at www.2bsquare.com.